Here are the five must-read, must-watch auto news stories and videos for Wednesday, December 16, 2015. Ever since Infiniti restored its G nameplate in 2002, the brand’s entry-level sedan has been anything but short on power. 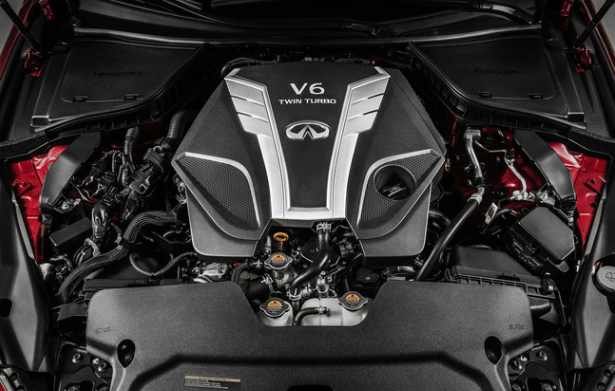 But for the 2016 model year, Infiniti’s G35/G37 successor, the Q50, will be offered with even more power, including a 400-horsepower, twin-turbocharged 3.0L V6. There will also be a 300-horsepower V6 and a 2.0L turbocharged four-cylinder with 208 horsepower, an engine you know from the Mercedes-Benz CLA250, Mercedes-Benz GLA250, Mercedes-Benz Metris, and Infiniti’s new Q30 and QX30. As pitiful as alphanumeric names so often are, Mercedes-Benz appeared to have built up some cachet with the SLK roadster. So they’re throwing it away, just as they’ve tossed overboard the M-Clas, GL-Class, and GLK-Class. The SLK is now the SLC, and replacing the SLK55 AMG is this Mercedes-AMG SLC43. Replacing the 5.5L V8 is a 3.0L twin-turbo V6. So what’s the deal with the 43 part? Ford’s four former core brands at the Blue Oval’s Premier Automotive Group haven’t completely gone their separate ways – Jaguar and Land Rover remain paired at India’s Tata Motors. But Chinese-owned Volvo and Ford-owned Lincoln and the JLR tandem are now isolated entities. How has their status been affected in the U.S. over the last decade? To what degree can Volkswagen turn the tide of public opinion if the company introduces an all-electric Microbus at the CES next month? Likely not as far as Volkswagen could turn the tide if they delivered a production Microbus with a mass-appeal powertrain, a vehicle that would appear on driveways near you in 2017. We’re big fans of the new Mini Clubman. After Mini flubbed the first-generation, the new Clubman is a genuinely spacious Mini, but with more handsome proportions than the 5-door. And the barn doors do look cool, even though they’re a bit of a nuisance.